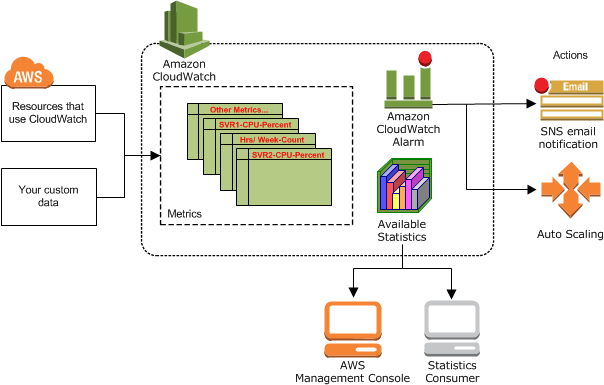 Amazon CloudWatch is basically a metrics repository. An AWS service—such as Amazon EC2—puts metrics into the repository, and you retrieve statistics based on those metrics. If you put your own custom metrics into the repository, you can retrieve statistics on these metrics as well. You can use metrics to calculate statistics and then present the data graphically in the CloudWatch console. For more information about the other AWS resources that generate and send metrics to CloudWatch, see AWS Services That Publish CloudWatch Metrics. AWS Cloud computing resources are housed in highly available data center facilities. To provide additional scalability and reliability, each data center facility is located in a specific geographical area, known as a region. Each region is designed to be completely isolated from the other regions, to achieve the greatest possible failure isolation and stability. Amazon CloudWatch does not aggregate data across regions. Therefore, metrics are completely separate between regions. For more information, see Regions and Endpoints in the Amazon Web Services General Reference.